Nowadays there is an SSL vulnerability called POODLE discovered by Google team in SSLv3 protocol. So uses of SSLv3 is not secure to use. Now it’s recommended using TLS 1.2. 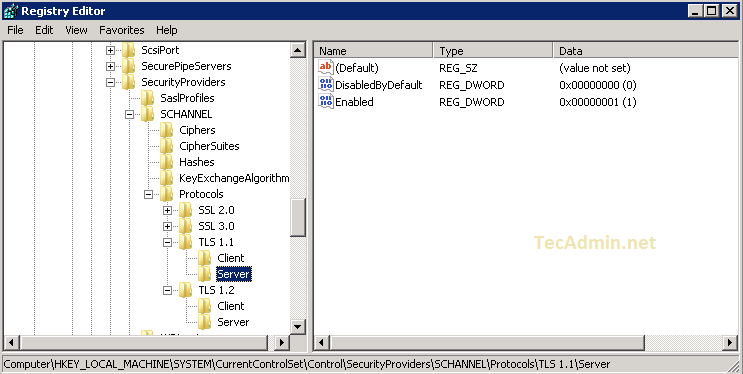 This article will help you enable TLS security in Windows Server 2008 R2 or later versions by editing registry. We strongly recommend taking a backup of the registry before making any changes. Use below link to find steps to how to export registry values. You have two options to enable TLS version on your system. Download the Enable-TLS12-Windows.reg and Enable-TLS12-TLS11-Windows.reg files on your Windows system. Now right click on file and click Merge. You can do this by directly editing registry file manually. 2.1 Open registry on your server by running ‘regedit‘ in run window and navigate to below location. 2.2 Add the TLS 1.1 and TLS 1.2 keys under Protocols. It will looks like directories. 2.3 Now create two keys Client and Server under both TLS keys. 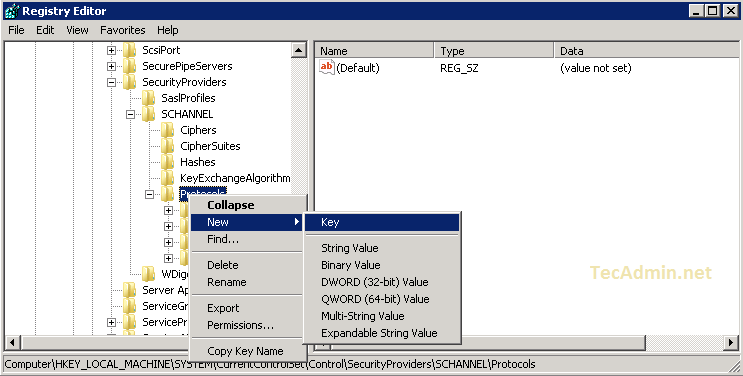 3.1 Open registry on your server by running ‘regedit’ in run window and navigate to below location. 3.2 Now change DWORD Values under Server and Client under TLS 1.0, SSL 3.0 and Older SSL version keys. After making all above setting reboot your server. Please dont provide a false information on something that you are not sure about ! We have developed a Web API application and we are using Mutual TLS V1.2 for Authentication. We have two servers (X and Y) in INTG Environment and also we have a load balancer. Server X and Y are accessed via load balancer server. I have hit one of the Web Api Get request URL by selecting the Client certificate in Chrome browser if the request goes to server Y and if I pass a valid INTG client certificate it’s working fine and If I pass invalid client certificate or other environment(SYST) certificate it throws 401 UnAuthorized. This is the correct behavior and it is working fine in Y. But in the Server X if I pass invalid certificate it’s throwing 401 Unauthorized but if I pass SYST Client Certificate it’s working and I am getting the 200 response. It should not accept SYST client certificate in INTG Environment and it should throw 401 UnAuthorized but it is accepting it and I am getting 200 Response. I verified both the server configurations everything appears same and I don’t see any difference. I identified this issue by stopping the site alternatively in both the servers. We are using “iisClientCertificateAuthenticationMapping” and in that we have set the “manyToOneCertificateMappingsEnabled” as False and “oneToOneCertificateMapingsEnabled” as True and for “oneToOneMappings” I have set the userName, password and certificate(base64string). Can you guys please let me know what are the possible reasons for the X server’s incorrect behavior. I have did exactly same on windows 2008R2 SP1 but to my surprise when i run wireshark logs i can see the communication still happens on tls 1.0. Why is it so ? I am running Server 21012R2, and made all the suggested changes. Still, I get the handshake error when using Chrome. Is there anything else that must be done, downloaded, upgraded, whatever, to make Chrome work again? This is an update that came out in 2014, but had not been installed on my server. It is a fix to a vulnerability in SChannel. After installation, Chrome displays my site properly. Ugo Meex, you have made my day! This is the official Golden TIP of the month! Took me 4 days to investigate why Windows 10 1511 (fall update) clients couldn’t connect to our RADIUS Wi-Fi network anymore. With your tool, it took me 3 mouse clicks and 1 reboot…. everything solved. It should be made very clear that this works for Server 2008 R2 and later, but *will not* work for “Server 2008” (which also means, it will not work for SBS 2008 either). Unfortunately, the article title is misleading; TLS 1.1/1.2 are not supported prior to Server 2008R2 and SBS 2011 on the server side. While this article is certainly very useful, in a windows environment it would be far easier to use the IISCrypto tool by Nartac Software. It’s small, it’s free, it’s easy to use. Rather than having to read and edit the registry, this utility gives you a GUI to make these changes. Your script does the exact same thing as the manual instructions listed in this article, how is it incomplete? I ran this script and it did nothing. I have Server 2008 R2. FYI, I do not have TSL 1.0 and 2.0 but if I am not wrong this script should create entries for these. This will not work on Windows Server 2008 SP2 but does work on Windows Server 2008 R2. TLS 1.1 and TLS 1.2 does not seem to come with Windows Server 2008 SP2, a bit of an issue for me. Hi Rahul, thanks for this. Shouldn’t your Step 3.2 be: DisabledByDefault [Value = 1] rather than [Value = 0] to disable by default? No. By setting the value of DisabledByDefault to 1, you are making the value true, thus disabling the protocol “by default”. Isn’t disabling the SSL protocols by default exactly what is wanted? Will this instruction to add TLS 1.1 and TLS 1.2 work on Windows 2008 Standard version?